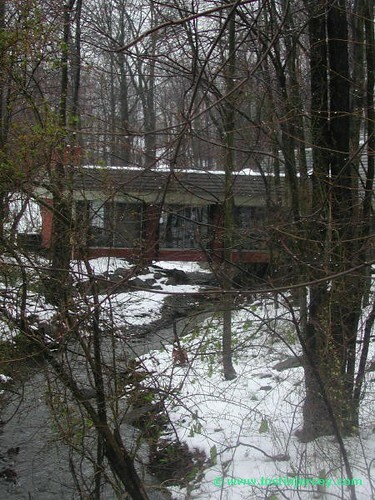 The pictures are rather dark but as you can see they built an extension to the home over a creek. 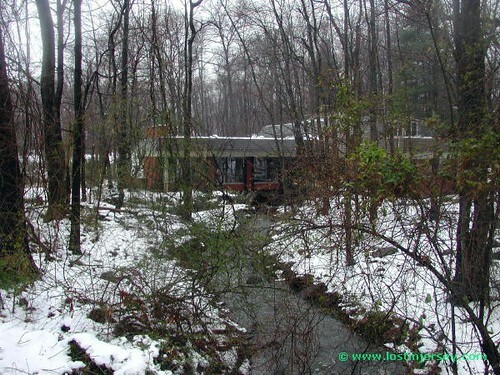 Apparently the homeowner has a whole water garden in the back and building over the creek allowed him the ability to expand and not disturb the flow of the water. That’s all fine and good, but what happens during a flood like we got in Hurricane Floyd? The owner promised to let me visit the garden at some point and I’ll update the site with more pictures and the full story when I do it. Is there a panther prowling around Mercer county? somebody said panther and the cops thought they meant the black panthers… ^@!&(@#_( retards…. Residents in the rural New Jersey community of Vineland are used to seeing wild turkey, the occasional deer and once in a great while, even a bear. But reports that a black panther has been roaming the woods have some people worried. Residents over the weekend reported seeing a large black animal with a long tail walking through the fields and woods. From the look of it, they don’t think the feline is a well-fed pet, but a panther. “I knew by the size that it was not a house cat. It wasn’t a tiny dog. It looked like some kind of wild cat,” said Zoe Paraskevas, who lives on Old Farm Drive in the Cumberland County city where the cat was spotted. She said she saw the animal in the field behind her house on Saturday and quickly snapped a picture of it. “I just got chills. I said ‘Oh, my God!’ I just couldn’t believe what I saw,” said Paraskevas, who said the animal walked through the field for about 30 seconds before she lost sight of it in the woods. Since then, Paraskevas, who said she first saw the animal in March, said she’s seen the black furry animal a few more times as have some of her neighbors. Felicia Fiocchi said she spotted something in the field behind their house on Sunday about 1/4 mile to a 1/2 mile away. “I can’t tell you if it was a panther, but I can tell you that it wasn’t a domesticated house cat,” said Fiocchi, who lives on the street with her husband and four children. She’s worried about the possibility of a dangerous cat roaming the woods and fields where her four children sometimes play. Authorities, however, have not spotted the mysterious visitor. A conservation officer from the Division of Fish and Wildlife visited the area three times over the weekend and found nothing to indicate a panther was in the area, said Darlene Yuhas, a spokeswoman for the state’s Department of Environmental Protection. “There was absolutely no evidence to indicate that there was a panther out there,” Yuhas said. Paraskevas said she was told by the conservation officer that the ground was too dry for the animal to leave paw prints. Lt. Steve Cleveland from the Vineland police department said the idea of a black panther in the area was so unheard of that when the department first received the report, they thought someone was talking about the Black Panther Party — a political organization. Despite that, he said the department is not taking the concerns lightly. An animal control officer has warned residents to keep a close eye on their children, and residents are advised to call authorities immediately if they see any large animal in the area. Built in 1968 by architect Matti Suuronen, this concept house was designed to be used as either a vacation home or a mobile home. It is constructed of lightweight plastic so it can easily be transported. It supposedly can sleep 8, and has a kitchen and bathroom. Cooking was to be done using a portable ‘firebox’ which could go on the table, or be put away. Steel legs supported the cabin. A door dropped down, spaceship style, to let people in or out. Built by a New Zealand company, Futuro Industries, they were built just as the oil crisis began. This raised the price of building materials and that was the end of the Futuro House. Somewhere between 20 & 60 of these concept homes were built, and most are still in existence. This one is now being used as a PAL HQ in a park in Willingboro. The book is only available thru a handful of retaailers, none of them American. I got my copy thru Desura..